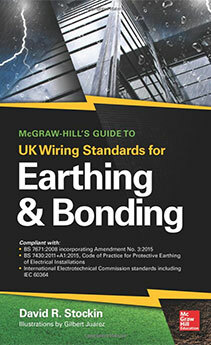 Our engineering manager David Stockin is the author of McGraw-Hill's Guide to UK Wiring Standards for Earthing & Bonding which discusses above-grade wiring issues and below-grade earthing issues related to electrical earthing and bonding. E&S Earthing Solutions is the premier electrical earthing, and electrical safety consulting firm and contributors to the McGraw-Hill book "Standard Handbook for Electrical Engineers" authoring chapter 24: "Earthing Systems" in the 16th Edition. Should you make neutral-to-earth bonds in electrical panels? What are the lightning protection standards for lightning down conductor installation? What is the difference between neutral and earth wires? Why are 94Hz, 105Hz, 111Hz, and 128Hz frequencies used for earth ground resistance meters? What Are Some Typical Electrical Earthing Testing Procedures? Is a #6 conductor the “Catch-All” earth wire? What is the purpose of the PVC sleeve in concrete earthing? Why does my surge protection device say not to use it with power cords? Do fire sprinkler systems need to be earthed? How do you provide lightning protection for a boat? How do you safely deal with isolated earthing systems when considering lightning? Is a GFCI outlet required for a water cooler? What does it mean when a 50% earthing bar is listed? Will a ferrite choke help with lightning on a cat 5 cable? I am trying to protect the electronics the cable is connected to.